Portland State University Library Special Collections & University Archives announces a new oral history project focusing on the Portland Black United Front. 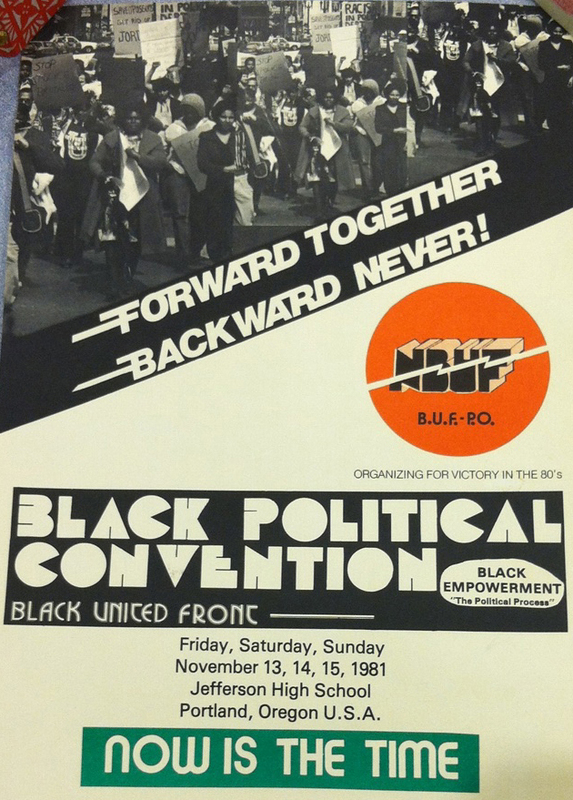 A poster for the Portland Black United Front convention in 1981, from the Avel L. Gordly Papers. Portland State University public history students conducted the interviews in this oral history project in 2010. In winter 2015, with Professor Patricia Schechter, a second cohort of students reviewed the recordings and transcripts of the oral histories and created a digital exhibit containing audio and written excerpts from the interviews, photographs, and historical and biographical information. The interviews focus on African American activists in Portland who led or supported the work of the Black United Front. The Portland BUF chapter was a branch organization of a national group founded and based in Chicago, which pressed forward a civil rights agenda during the 1980s. The BUF took on local issues from the earlier mid-century movement such as school desegregation and police brutality, as well as global ones like the fight against apartheid in South Africa. Notable accomplishments of the Portland BUF involved education, and many of the narrators interviewed for this project highlight the transformational power of education in their lives as students, teachers, and advocates. The online collection contains full transcripts of the interviews given in 2010.